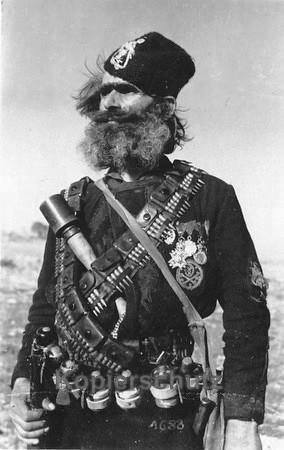 A heavily-armed Serbian guerrilla warrior, Yugoslavia,1943. Numerous reports submitted by the British authorities to the Yugoslavian refugee government contain detailed information on British material and financial aid to Chetniks. The first shipments of air were lowered to Mihailovic on November 9, 1941. Subsequent shipments by submarine followed in January 1942 and four deliveries by air in April 1942. Again between June and October 1942, and delivery by planes in December 1942 and in February, March and April 1943. Finally, there is a report on shipments between May and October 1943. 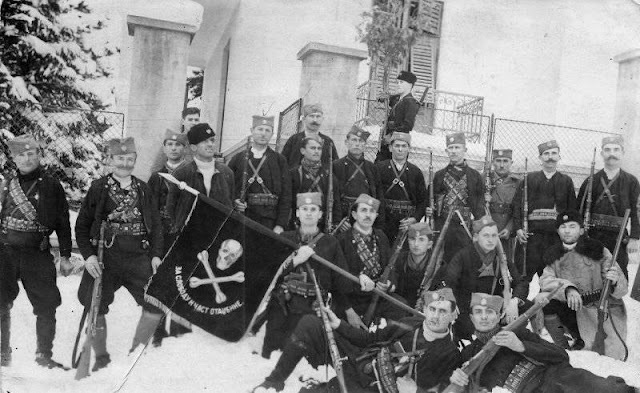 The total quantity of weapons and ammunition supplied by the British to Mihailovic was according to these reports: 43 mortars, 860 mortar ammo, 307 revolvers, 1,203 submachine guns, 1,866 rifles, 136 light machine guns, 217 guns,. 104 AT guns, 8,728 hand grenades, 1,029,450 bullets for various weapons and 2,368 kg of explosives. The Chetniks' weapons units depended on where the units were located and from the war period. 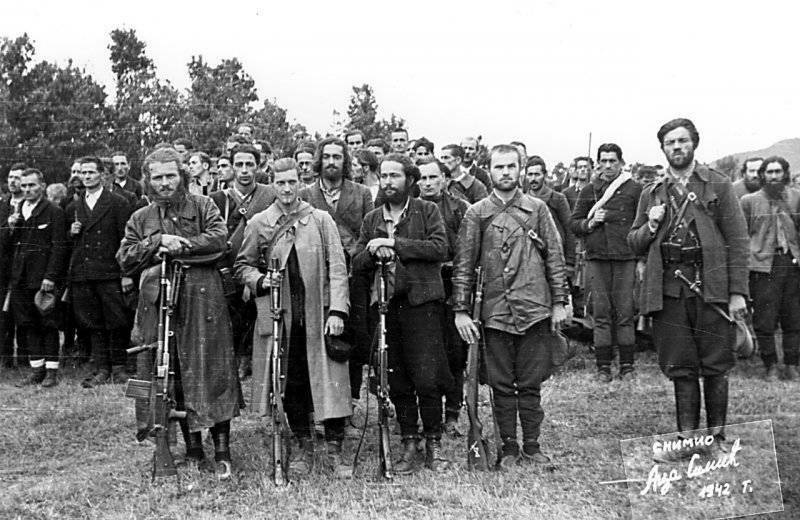 In Serbia, until 1944 standard guns were various versions of Mouser in the 7.9 calibers as well as the Manicure M95 rebuilt to the same caliber. The standard machine guns were Zbrojovke of various versions of Vz. 26, Vz. 30 and our M. 37. There were not many MGs. Submachine guns were mostly seized by the German MP 38, MP 40 and MP 41. 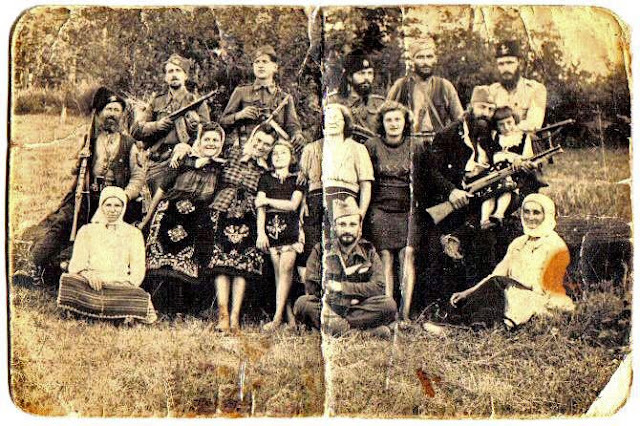 There were also Czech ZK 383 used by Bulgarians. These SMGs were especially appreciated. Of course, there were many other weapons, but it was mentioned by the beginning of 1944 probably 90% of Chetnik's weapons. From the beginning of 1944, a considerable amount of weapons from the British was obtained, and Lee Enfield rifles in a 7.7 mm caliber. Bren light machine gun of the same caliber but also the Brenes made in Canada in a 7.9 mm caliber originally intended for Chiang Kai Shek's forces in China. Submachine guns Sten and multiple versions and AT rifles Boys. Especially a lot of Sten machines arrived. There was also something SMG Tomson but not much. 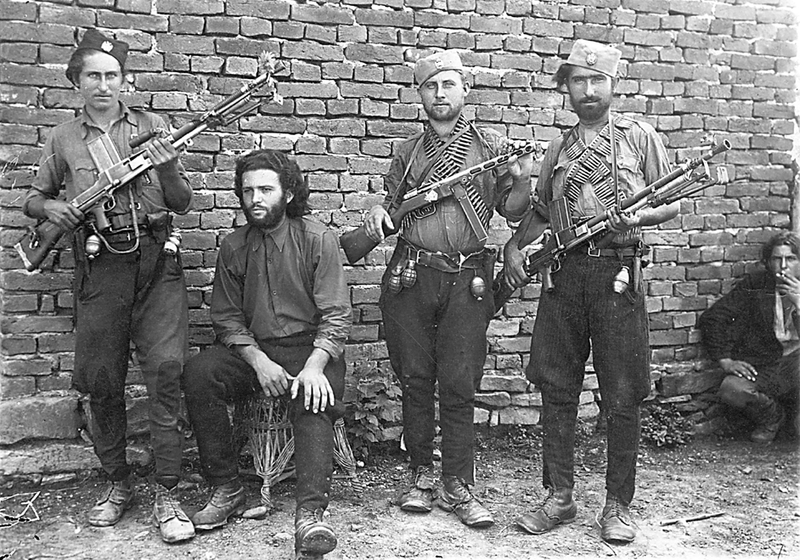 Let's go in sequence: the chetnik who stands first on the left holds a shorter variant of the Austrian rifle "Steyr-Mannlicher" M95, originally in the 8x50R caliber. The same rifle holds the fighter far right with a cross ammo belt over his chest. 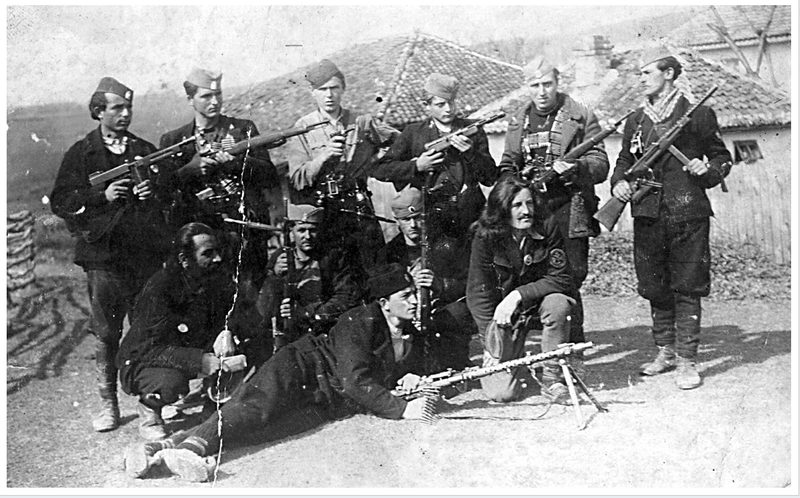 Part of these rifles was remodeled before the war in Užice by having built-in barrels 7,92x57mm M24 and these guns have the mark M95M. I think that in the picture of unprocessed rifles, it is very possible that it is a question and a model that was delivered to the Bulgarian army since the end of the 19th century, so the Balkan and world wars Bulgarians led with this weapon in their hands, but mostly in the stronger caliber 8x56R. Quite often weapons in our area, and problematic because of the straight line shutter. The third from the left of the "standing" is in the hands of Sten MKIII.Two layers are armed with MG, left is ZB and right MG34. You must know enough about them. Special attention deserves the duel that stands on the left side - in his hands is a French machine gun "Châtellerault" 24/29 in the caliber 7,5x54mm. 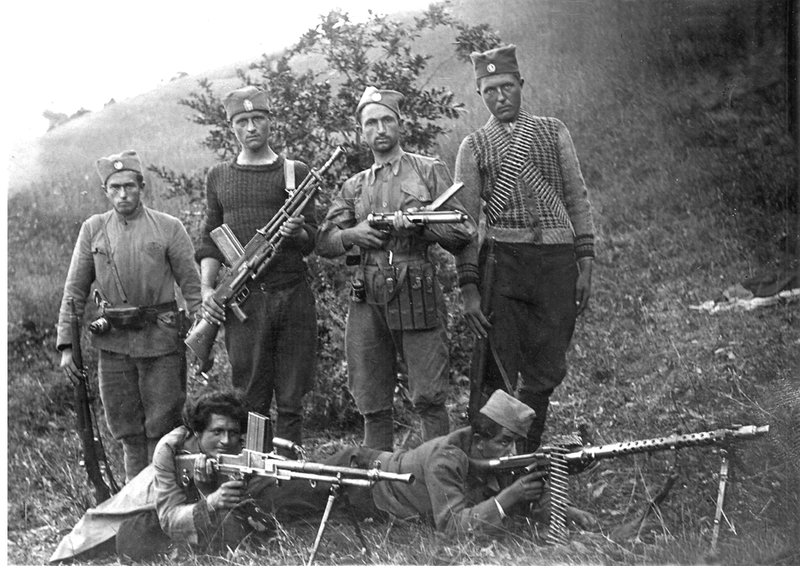 This SMG in the hands of the second Chetnik on the right is German processing of the Soviet "Spagina" PPŠ41. When they captured large amounts of these machines, the Germans were first used in the "original" condition, and (I think) about 8,000 slot machines are processed so they replaced barrel 7,62x25mm TT and inserted new 9x19mm Para. At the beginning of the war, for example, the standard machine gun was the Madsen M24 in a caliber of 8 mm, but during the war it was mainly replaced with MG Zbrojovka mainly Vz 30 (there were plenty of already mentioned Canadian Brenes in the caliber 7.9 mm from the booty) as well as PM Solothurn also in the caliber 7.9 mm.